If you are like me you listen to a plethora of aviation podcasts. I think some of the best aviation news comes from them and they stay on the topic I most care about most... aviation. A few months back I was listening to an episode of the Airplane Geeks Podcast and they were talking about the airplane of the week. One of the choices was the Aeronca Champ. If you didn't know back in the fall of 2008 I received my tailwheel endorsement in a red 1942 7AC Aeronca Champ. I don't think I've loved and airplane more then the Champ. I think it's a smilier experience to a first car or girl friend you never seem to forget it. Flying the Champ is real stick and rudder flying. Like any tail dragger you have to be quick on the rudder peddles but not hard I can still hear my instructor saying toe pressur that's all you need to control the rudder, sometimes not even that much just thinking about adding left or right rudder would do the trick. There is a real finesse in flying that I think so lost flying heavy more stable aircraft like a Cessna 172 or Piper Warrior. 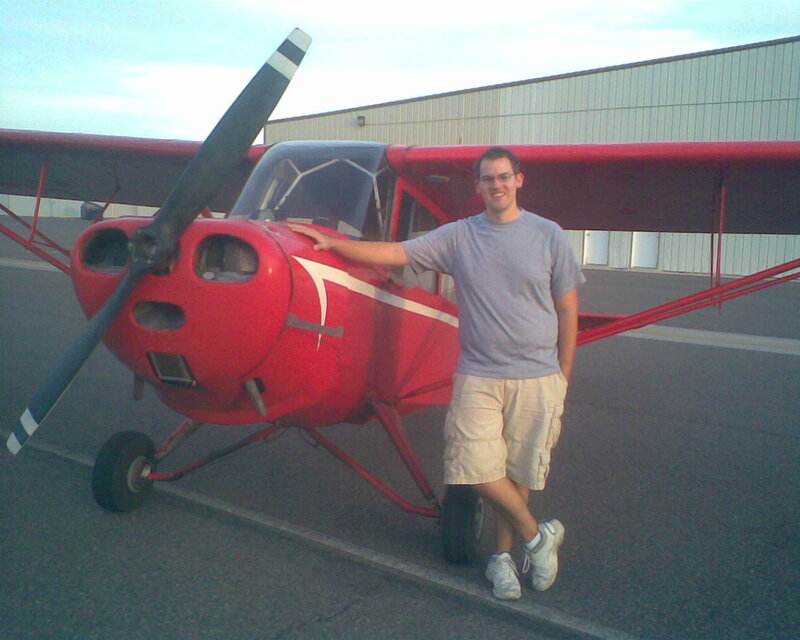 Just before my tailwheel endorsement I had just earned my private from Arizona State University's Pilot Development Program. A great program that gave me a great base of knowadge of aviation and my future certificates. But it was also very airline cockpit and Crew Resource Management (CRM) oriented. The company procedures were many and the Pilot Operating Hand Book (POH) for each plane were hundreds of pages along with the other supplement guides that the school required to fly with. In contrast the Champs POH was barley 50 pages. The equipment on board was a radio, transponder, altimeter, airspeed indicator and an oil temp gauge. Flying the Champ was like riding a bicycle Once I got the hang of it and in coordinated flight you could just feel everything in balance and it felt good. The visibility in the plane was amazing. It had large windows all around you and tandem seating so there was no one next to you to block your view. With a stick between your legs in place of a yoke it made the Champ more my kind of flying. After receiving my endorsement the Champ was my first choice for the airplane I wanted to take up as offen as I could when going around the patch or for short trips. It was fun and cheap then only $62 an hour wet! The airplane geeks did featured the Champ as the airplane of the week and David Vanderhoof did a great history segment on it followed by a story I told about flying back from Payson AZ to Mesa AZ and the experience I had of almost running out of fuel, I thought. hope you enjoy.